Somewhere in the world, right this very minute, a member of a film production crew is scrambling to figure out the name and address of his shoot’s location. He needs a call sheet, and he doesn’t have one. Don’t let this happen to a member of your team — and don’t let it happen to yourself. The only way that you can prevent potential shoot day meltdowns is by creating a call sheet. There’s a fine art to everything in this industry, even when it comes to the tedious task of making a call sheet. Mastering this art is simply a matter of making call sheets that effectively answer the who, when, what, and where questions that come up about every five minutes on shoot day. When you look at a call sheet, all the information may seem pretty straightforward… but putting one together can be an intimidating task. Since you’ll need to be making all kinds of phone calls and sending emails throughout the process of building your call sheet, it’s a good idea to start with the list of contacts. This means all the contacts — like every single person involved with the project. Here at Stillmotion we separate the production crew’s contact information from that of all outside parties involved with the shoot — the talent, the managers of locations you’re going to, caterers, etc. We’ve got a “Production” section with all the crew’s information, and a “Contacts” section with the information on everyone else. You’ll want the full name, role/position, email address, and ESPECIALLY the phone number of anyone involved with the shoot to be included on the call list. Who, what, where, when… and weather! 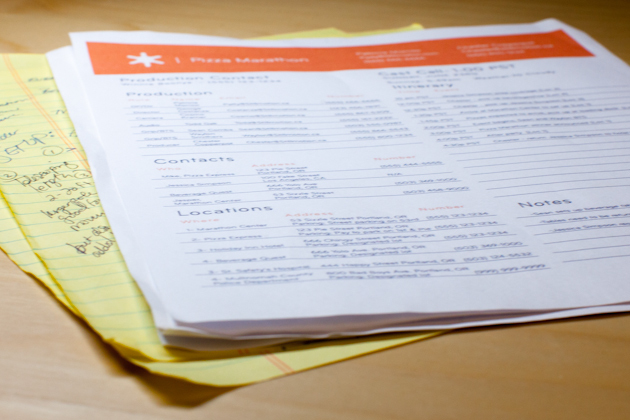 On your call sheet’s header, you’ll want to put the big, important information in a nice big, important font size. When is sunrise or sunset? Or both! When do I start making this thing? Gathering all the information could certainly take a few days… it’s a good idea to keep an open document on your computer to record all the contact information and make notes throughout the week leading up to your shoot. Once you’ve got all the information, entering it into your call sheet shouldn’t take long unless you’ve got a freakishly low WPM count. Also, you’ll find that as the details get worked out, plans and schedules will change… sometimes you might not get your final draft out to the team until 24 hours before call time! Obviously sooner is better, but at the very latest you’ll want to get the call sheet out to the crew 24 hours before call time. Who gets a call sheet? You’ll want to give a call sheet to anyone and everyone involved with the shoot. This means the production crew, the talent, the talent’s manager, and especially your client. Sometimes the client won’t be around much on shoot day, or they’ll be in and out — but it’s going to make them much happier if they feel like they have a sense of what’s going on throughout the day. One thing to consider is whose information you’re giving away on your call sheet. This is important to think about when you’re working with talent or “important people” who might not want you giving away their phone number to just anyone. Members of your crew who you know and trust aren’t anything to worry about, but if you pick up a P.A. or hire someone on for the day who you don’t really know… it might be a good idea to make a different set of call sheets for these people. Hey, we’re not one to play favorites but… this might be the *most* important part of your call sheet. People gotta know where they’re going! All of your shooting locations, and any place that you’ll need to pick something up are going to need to be listed here. Be sure to number each one, so that when you reference “Loc 1” on your schedule, people will clearly understand what that is. You’ll also notice that we put the location of the nearest hospital and the police department (with phone numbers) in this section as well. Some people put this information in its own section, or in the “Notes” area — it doesn’t really matter where you put it, as long as it’s on there somewhere. Preparing for emergencies should always be prioritized! PARKING! This is something people are always thankful that we include on our call sheet. This is another one that you could put in its own section on the call sheet, or in the notes… we find it fits best in the locations section. 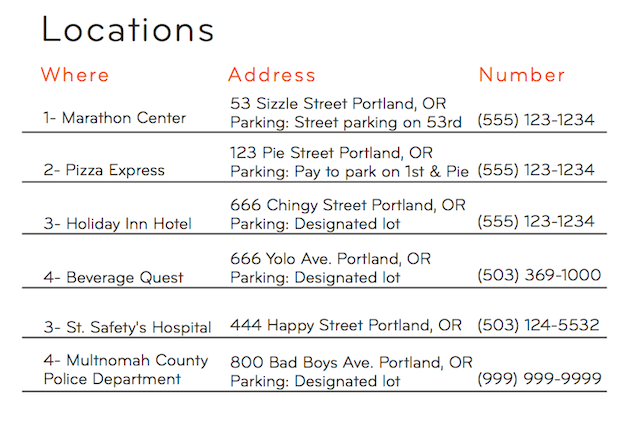 If the parking situation is scout-able, scout it out and get the skinny on where to park. Or, give the site’s manager a call — they’ll usually give you the scoop on where to park! How do I make the schedule? This will probably be the most challenging part of the call sheet process, because the itinerary is often subject to change. For that reason, you’ll want this to be one of the last things you do on your call sheet. Sit down with the Director and maybe the DP, and work out the details of the day. What’s the order of events, and how long will each one take? Depending on the type of shoot, this section will have more or less detail. 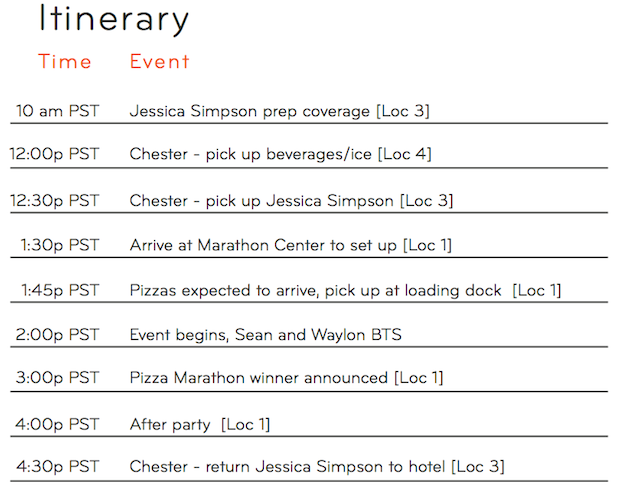 If it’s a small live event — like the “Pizza Marathon” — you might have less detail to give about “scenes,” but rather it will be more helpful to list the events of the day. This section is not the shot list (use SMAPP for that!) — this is simply a list of the day’s schedule, so everyone knows where to be and when. While we already know your call sheet is VERY informative and efficient… it doesn’t hurt to rally up the troops and go over the call sheet together as a family. This is a good idea in that you’ll be able to answer any questions raised by the team, and if you missed anything you can note it or (if there’s time) make a revised, final draft of your call sheet. We love you… have a template (and other cool stuff). If you’d like to receive a free template of the call sheet we use here at Stillmotion, sign up for our email list (below) and we’ll send you one! By signing up for our email updates you’ll get frequent (but not too frequent) emails to let you know when we post something new on the blog, or have a cool opportunity we think you’d be interested in. We’re all brothers and sisters out here in the filmmaking world… we gotta look out for each other! The first chapter of KNOW, our filed guide to filmmaking. As promised — our call sheet template! Last but not least: make it your own. Templates are nice, and make the process easier… but we totally encourage you to make your own call sheet with your own design! Use our template to get started, but like most things in the filmmaking biz you’ll need to find what works best for you and fits your style. Got any tips of your own for making a good call sheet? But seriously. You’re on the top of my fav list right now. Great post, thanks ! That’s very useful. PS I wanna live on Yolo Ave.
One question? Why is everything you guys do… AMAZING! Great to see how you guys are building a community through your great blog entries and extensive how-to video library. Always look forward to your newsletter/email updates, the call sheet post is really helpful. Thanks! Perfect timing with the pre-production of my first fiction short-film! What did you guys make your call sheet on… what program? Thanks a ton! We use Adobe Illustrator to make ours. InDesign is also good! Thank you very much, brothers and sisters! site to take newest updates, so where can i do it please assist. The downloadable PDF is not near the same beauty as the call sheet on the pics for pizza marathon. 🙁 No release of the Call Sheet shown in the article?